First Solar led a rally after a report showed demand rising in a key market. The future looked so dim at the end of last year that JPMorgan Chase put First Solar on its list of stocks to avoid in 2013. First Solar's fourth-quarter sales figures were disappointing, along with its first quarter outlook. But earlier this month, the company issued much stronger earnings and revenue guidance for the remainder of the year. 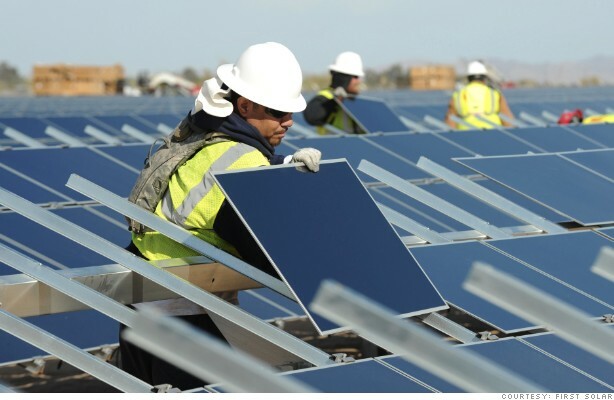 Solar stocks were also getting a boost Wednesday from a report suggesting demand from Europe was on the rise. While China is a big supplier to Europe, research firm IHS noted that antidumping legislation in Europe is cutting into those sales. And that's helping U.S. solar firms. StockTwits traders like what they're seeing. There are two stocks you don't expect to see in the same sentence. But I'd be remiss if I didn't address it. BlackBerry (BBRY) recently surprised investors with a profit...and strong sales of its new Z10 smartphone. $FSLR FREE AS A BIRD! It's notable that the buying isn't confined to First Solar. The IHS report really created some nice upward momentum across the board. "With clear signs that the balance between supply and demand is correcting, [solar panel] prices have stopped their decline and have begun to rise," said IHS senior analyst Glenn Bu. While Chinese suppliers may have been cutting back because of the antidumping laws, growing demand in Europe will likely keep pushing prices higher across the board.